Siebe Bouma (1899-1959), who worked for Groningen’s public works department, is best known for the schools and housing he designed in a local variation on Amsterdam School style. 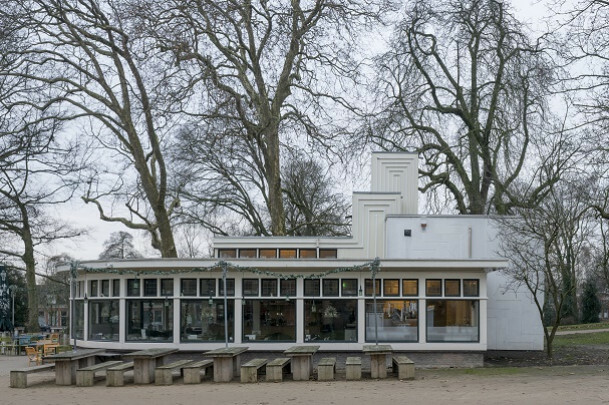 As municipal architect, he also drew a refreshment pavilion for siting in Noorderplantsoen. It combines a rounded conservatory-like public space along the pool and a number of cube-shaped ancillary spaces. The decorations and contours seem inspired by J.J.P. Oud’s site manager’s hut and Café De Unie. Even the colours used (red, black and yellow) seem informed by De Stijl. The large box shape was probably yellow with red lines.